An excursion to discover the historical and architectural treasures of the city of Trieste. Our journey to discover Trieste begins with a panoramic coach tour which gives us a first taste of the major monuments of the city. After leaving the coach, we walk up to the Cathedral of San Giusto (St. Justus), situated at the top of the Hill of San Giusto, which dominates the city; the Cathedral was built next to the Medieval complex which dates back to the 13th century. Here, accompanied by our guide, we can enjoy a close look at the interior of the church: the magnificent Byzantine mosaics in the apses, the frescoes depicting the life of the Saint dating from the 13th century, the remains of 5th century mosaic floors in front of the presbytery, the organ, restored after World War II and the rose window framed by the original Neo-Classical wooden structure. Our excursion proceeds with a guided walking tour of the city centre. In the very heart of the city is the Canal Grande, a navigable canal built between 1754 and 1756 by the Venetian, Matteo Pirona. 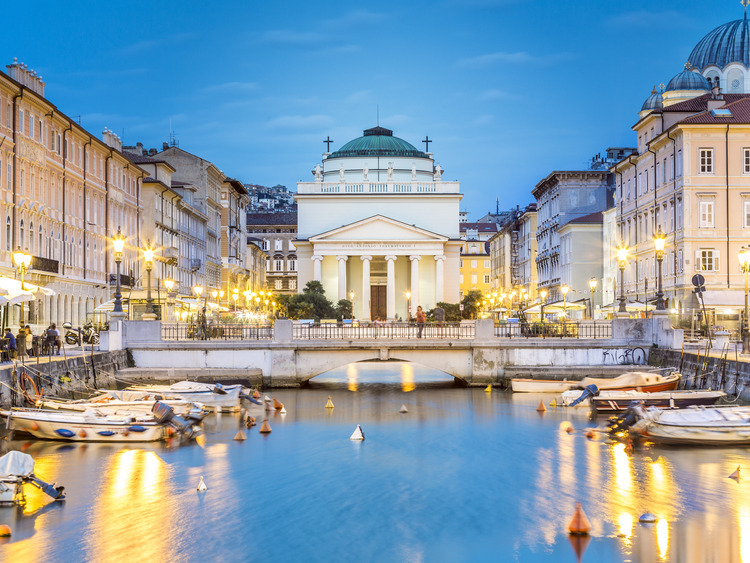 Palazzi and the residences of the rich merchants of the past, Orthodox Church , Piazza della Borsa and Piazza Unità d'Italia all overlook the canal. We have some free time here to enjoy the atmosphere of the city to the full. We proceed towards Miramare Castle, an architectural masterpiece, built in a spectacular position, on a rocky promontory of karstic limestone origin, which extends towards the Gulf of Trieste. The Castle, built between 1856 and 1860, at the behest of Archduke Maximilian of Austria, was heavily influenced by the Romantic style, a revisitation of a Medieval fortress. The huge park which surrounds it (more than 22 hectares) boasts a wealth of rare plants, sculptures and ornamental lakes and ponds; a series of steps lead down to the sea. The breathtaking scenery invites us to immortalize these unforgettable moments with photographs. At the end of the visit we head by coach towards the airport of Trieste or Venice. The excursion is reserved for guests who disembark in Trieste. This tour ends at Trieste and Venice airports.